We thought Dallas was friendly but the people of Austin bring about a whole new meaning to the word. Within an hour of arriving, a woman has offered up her phone no. so she can give us a guided tour of the city! Almost every single person you walk by, looks you in the eye and asks how you are. In England, it sometimes feels like people go out of their way to look at the ground or at their phone or any place but at someone's face. Before we left for the USA, Steve and I had been trying to smile at every person we walked past, at first it's really awkward and for some reason embarrassing but the more you do it, the more people smile back and it's just a really nice feeling that maybe you made someone's day a little bit better. We challenge everyone to try this and see what can happen, wherever you are. We have arrived really late in the evening, to our fantastically colourful AirBnB. Despite the time, we don't even make it out to get food for at least another hour as the lovely lady who owns it is giving us a months worth of foodie recommendations. We stroll on down the road to find some dinner at 10:30pm and expect the street to be asleep but it's alive with lights and laughter. 'Luke's inside out' is a little trailer on the side of the street selling an inventive selection of French inspired sandwiches. They've been on the TV show 'diners, drive ins and dives' and it hasn't gone to their heads one bit. ( Infact the phone no. we got was from the woman taking our order). The Korean BBQ rabbit is generously filled with tender pulled meat and the kimchee Veg adds a terrific crunch to the herby potato cake, stuffed between the layers of soft French baguette. The salmon Sammie is tonight's special and it was just so moreish. Layers of perfectly cooked flaky fish and strips of crispy prosciutto wrapped around fresh sliced avocado and a creamy coleslaw. We were given this warning before bed ..' You will wake up tomorrow, it will be hot, it will be humid, and you will need to go swimming at Barton springs. Ok I don't need to be told twice. We woke up, it was disgusting and having finally eaten last night at 11:30pm, we were still full. Off we went swimming in the springs, it was the most refreshing and necessary thing we have done since arriving in Texas and we would thoroughly recommend it if you happen to be visiting the area. Also a helpful tip, you can get in cheaper if you are a local so get your Texan accents ready. We managed it and anyone who knows me is aware of my appalling ability to turn any accent into Jamaican. During our entire USA trip, I have actually been drinking more cold brew and iced coffee than hot coffee, it's not just the heat. The variety of cold coffees on offer is far greater than what the majority of Britain is currently offering. Cold brews on tap, nitro brew, and 'houndstooth' is offering something called ' the coffee julip'. Unique to them, this cold brew involves adding a little sugar syrup, sparkling water, crushed ice and fresh mint. 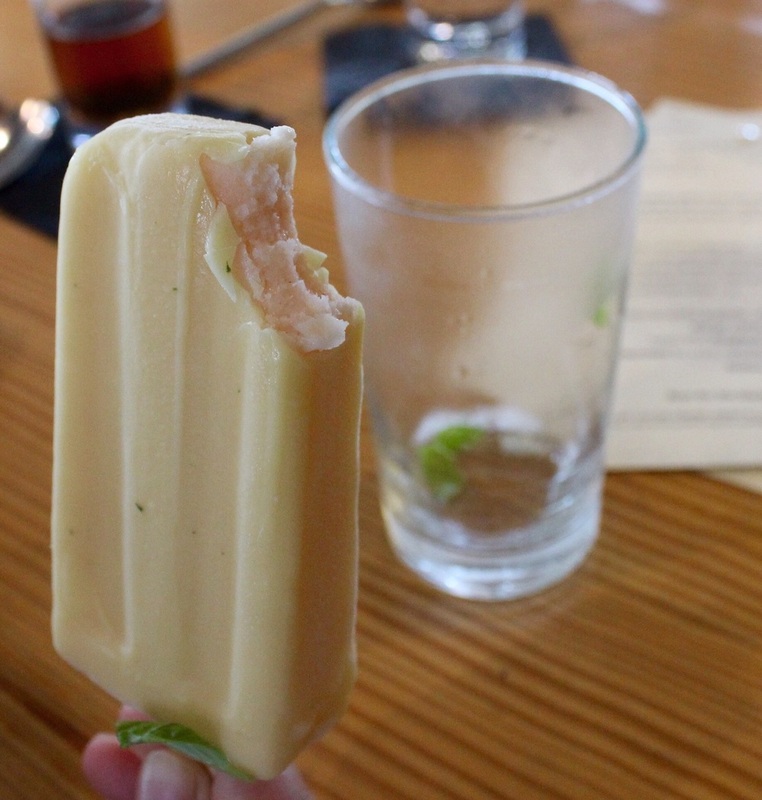 What a refreshing concoction, they even have a coffee Popsicle on menu that I'll be coming back for later. Lunch in the heat these days involves cake and pastries and 'Easy Tiger' are offering some sweet treats. A small choice of goodies sits on the bar area and a beautiful creek side beer garden is downstairs. This Danish kran has a delicious almond paste filling and is dotted with sugar nibs. At sunset in Austin, every night in summer, hundreds of people gather to watch over a million bats fly out from under the congress avenue bridge. It's a beautiful site to see the silhouettes of these mysterious creatures stream out into the sunset in search of their dinner. We're queuing up for 'Gourdoughs' because of the outrageous flavours they are creating. I don't for one second think that I'm going to be able to manage the monsterous size of these doughnuts but people are giving whole ones to their kids so I have to try. These guys started off with just the food truck but now have 2 restaurants as well. They're making each doughnut to order so it's taking a while but at least we know it's going to be super fresh. Steve is feeling ambitious with his choice of 'the blackout', it involves brownie batter, fudge icing and chocolate covered brownie bites. My 'dirty berry' has grilled strawberries with a chocolate doughnut and chocolate icing. We got no photos of the doughnuts as we were grabbing them as dessert for the cinema at Alamo draft house. Unfortunately we didn't realise that this cinema has a full bar and restaurant menu that you can order from and enjoy whilst watching the movie! So we weren't allowed our own food and after the movie the doughnuts didn't look too pretty. Sitting on the original site of their first food trailer is now the second restaurant opened by 'odd duck'. The focus of this place is to create a menu for the Texas seasons using local produce from Austin farmers. An awesome bar area stretches round the room and kilner jars filled with their house made pickled vegetables, have the shelves covered. The small menu sounds so delicious that it is still hard to pick out dishes. We start with a tiny house made roll, golden glazed and filled with (their description) pig's face and a mild mustard dip. The small plate of house pickled vegetables are beer battered and laid on a creamy egg mayo, clearly a take on pickled eggs it works well and luckily for me the battered jalapeño has lost some heat from its pickling. we share a 'daily taco' which involves a blue corn tortilla filled with, shishito pepper, house made breakfast sausage and cheddar. Cubed melon added welcome pops of sweet juices and complimented flavours. The dessert was so fun! A cantaloupe melon sorbet in ice lolly form, coated in a white chocolate crisp outer shell and sprinkled with fresh kafir lime leaves. The sherbet adds a light tingling tongue which reminds me of the popping candy sweeties we used to eat when we were little. We did fight over this as an ice lolly is hard to share but luckily we had ordered another dessert. Served in a teacup this ice cream was so rich with chocolate that it was like eating a cold but extremely indulgent brownie, an espresso foam coated the ice cream and an almond tuille drizzled with chamomile honey was placed on top. We have thouroughly enjoyed our stay here and there is plenty to see and do. Unfortunately I managed to book our stay over Labour day weekend so a few restaurant recommendations were closed. There is always a next time. Keep it weird Austin.